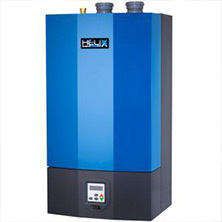 Boilers heat water use either hot water or steam for heating your home or building. A boiler in need of repair or one that is dirty and smelly is a danger to your home and safety. There are many safety devices that control your boiler. If your boiler is dirty and smelly TURN IT OFF NOW. Open doors, take your family outside for fresh air and Call Now – you may have a carbon monoxide leak. We understand the importance a properly working boiler for your home or work space, and at Hughes Mechanical we will make sure your boiler is working at its highest efficiency. The experts at Hughes Mechanical work with all makes and models of boilers and will provide you with quality and reliable service. If you need boiler repair or installation, give us a call and we’ll get the job done right the first time! Contact Hughes Mechanical today to schedule an appointment!